Know exactly when to stop highlighting with the help of a see-through tip of the Sharpie Clear View Highlighter. It features a transparent tip that makes it easy to precisely highlight text. Let ink dry before highlighting. 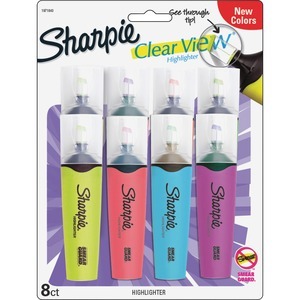 Clear tip allows you to highlight neatly and evenly all the way across the page. It precisely highlights to create clear, legible notes. Fine chisel tip draws thicker lines for highlighting or thin lines for underlining. Smear Guard ink technology resists smudging of many pen and marker inks. Highlighter is certified AP nontoxic.